Ace played eleven seasons with the National Hockey League. 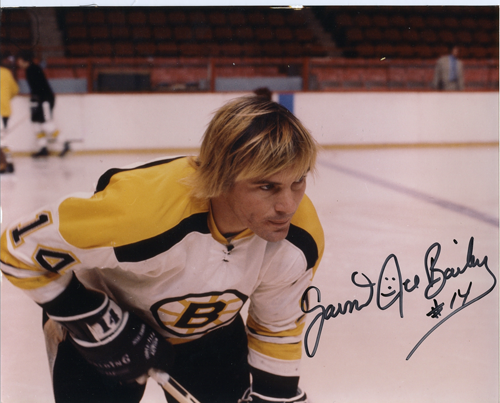 While playing with the Boston Bruins he was a member of the Stanley Cup championship teams in 1969-70 and 1971-72. He went on to play for the Detroit Red Wings, the St. Louis Blues, the Washington Capitals and the Edmonton Oilers. When Ace’s playing career ended following the 1979-80 season he moved first to coaching and then to scouting. In his roles as player and then scout, Ace earned seven Stanley Cup Rings. Boston Bruins, 1970. Ace standing in back row, 4th from left. Ace had huge heart and a quick sense of humor. He always made everyone laugh with his stories, jokes and ready supply of unique sayings. He had the gift of making everyone around him feel comfortable, at ease and part of the fun—even those who met him only once considered him their friend. Ace often visited pediatric hospitals and was once brought to tears when told that a terminally ill child that he had befriended had named his goldfish “Ace”. He was a family man who would rather be with his wife Kathy and their son Todd than anywhere else on earth. Ace was a great cook and never shied away from housekeeping—in fact washing floors, running the vacuum and doing laundry was a regular part of his frenetic daily life along with taking care of his yard, chickens and turkeys. Ace had a special love for children and children in turn took an immediate liking to him. He delighted kids by talking like Donald Duck, always coming up with something fun to do, and laughing with them for hours on end; after all, he was at heart, a perennial child himself.